When it’s hot—and I know my best friend, who lives in San Diego, would not classify eighty degrees as hot, but hey, we live in Boston—I, like other sane people, do not like to turn on the stove to cook. So here’s a salad that takes less than fifteen minutes to make and requires only a microwave (or an electric kettle). Before you do anything else, put the water on to boil (microwave, kettle, whatever). While it heats up, pour couscous into serving bowl of your choice, and give that cabbage a quick chop. Sprinkle the cabbage over the couscous, and pour the boiling water over both. Let stand while you slice the olives and grapes and chop the parsley. After five minutes, toss the couscous and cabbage together with a fork, adding a little salt, pepper, and olive oil as you go. The goal here is to let the couscous cool enough (by exposing most of its surface area to the air) so that it won’t melt the goat cheese on contact. Add balsamic vinegar and honey to taste (start with a couple tablespoons of balsamic and one of honey), along with a sprinkling of oregano. When you’re satisfied with the results, toss in the grapes, olives, and parsley. Taste again. Good? Everyone at the table? Excellent. Add your goat cheese, give the salad one last toss, and serve. Naturally, I forgot to add the white beans and green onions I bought specifically for this dish (oh coffee, I miss you), but it would be delightful with a can of (drained) chickpeas or cannellini beans added in, and garnished with green onions or chives. 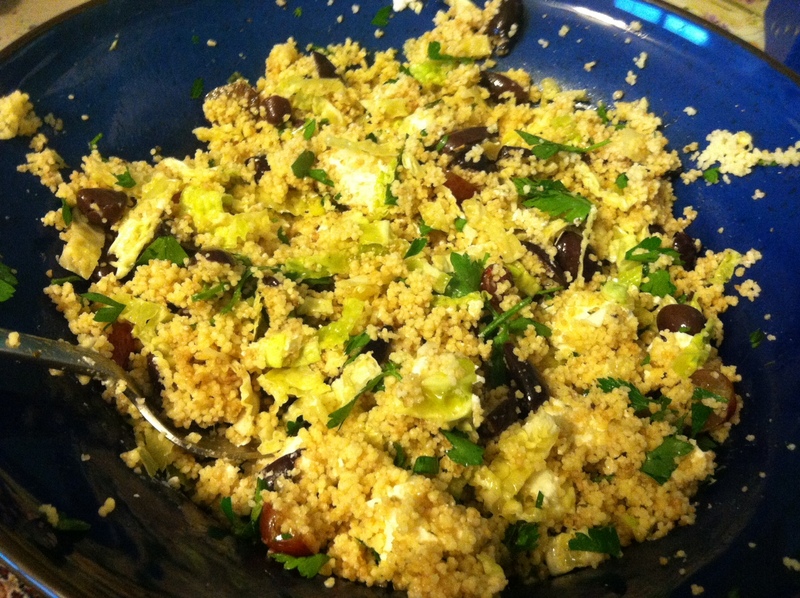 This entry was posted in Foodstuffs, Recipes and tagged couscous, forgetfulness, grapes, hot-weather dinners, olives, quick dinners, recipes, salad, vegetarian. Bookmark the permalink.